“Today, we are emerging from a period of strategic atrophy, aware that our competitive military advantage has been eroding,” the Pentagon’s new National Defense Strategy declares. “We are facing increased global disorder, characterized by decline in the long-standing rules-based international order” — a decline officially attributed for the first time not to al-Qaeda and ISIS, but to the aggressive behavior of China and Russia. Iran and North Korea are also identified as major threats, but of a distinctly secondary nature compared to the menace posed by the two great-power competitors. Commanding PACOM is Admiral Harry Harris Jr., a long-time naval aviator. In his annual posture statement, delivered to the Senate Armed Services Committee on March 15th, Harris painted a grim picture of America’s strategic position in the Asia-Pacific region. In addition to the dangers posed by a nuclear-armed North Korea, he argued, China was emerging as a formidable threat to America’s vital interests. Most threatening, in his view, is Chinese progress in developing intermediate-range ballistic missiles (IRBMs) and advanced warships. Such missiles, he explained, could strike U.S. bases in Japan or on the island of Guam, while the expanding Chinese navy could challenge the U.S. Navy in seas off China’s coast and someday perhaps America’s command of the western Pacific. To counter such developments and contain Chinese influence requires, of course, spending yet more taxpayer dollars on advanced weapons systems, especially precision-guided missiles. Admiral Harris called for vastly increasing investment in such weaponry in order to overpower current and future Chinese capabilities and ensure U.S. military dominance of China’s air and sea space. This, needless to say, is not the outlook we’re hearing from President Trump, who has long appeared reluctant to criticize Vladimir Putin or paint Russia as a full-fledged adversary. For American military and intelligence officials, however, Russia unquestionably poses the preeminent threat to U.S. security interests in Europe. 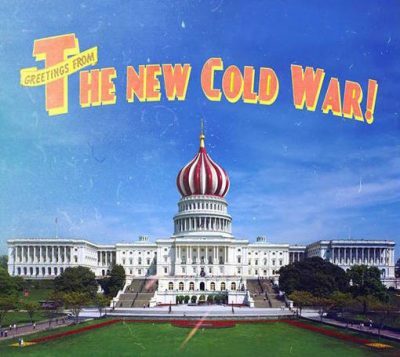 It is now being spoken of in a fashion that should bring back memories of the Cold War era. Under such circumstances, Votel testified, it is incumbent upon CENTCOM to join PACOM and EUCOM in resisting Chinese and Russian assertiveness.